Q: What is Visa Claims Resolution (VCR)? Visa Claims Resolution (VCR) is Visa’s new dispute program for chargebacks. Q: Why is Visa changing its dispute process? The new VCR program was designed to reduce time, cost, and the number of chargebacks by deploying a liability assignment model that leverages existing data. Q: What are the main changes to Visa’s dispute process? Visa is changing some of the terminology related to dispute resolution. Visa has created two new high-level dispute reason categories, “Allocation” and “Collaboration”. Visa has 25 new reason codes that are being used instead of the 22 old reason codes. Visa has shortened the end-to-end cycle for dispute resolution to 30 days as opposed to 45 days in the past. On Allocation disputes, no provisional credit will be given when challenging a dispute. Q: Who is impacted by VCR? All merchants, acquirers and issuers worldwide are impacted by the VCR program. Q: What is the Allocation process? Has the cardholder already received a refund from the disputed charge? Was the fraud dispute on a 3D Secure transaction? Q: What is the Collaboration process? Disputes categorized within the Collaboration process are related to processing errors and consumer disputes. Within Collaboration disputes, Visa expects that the issuer will collaborate with the merchant and acquirer to share relevant information related to the transaction in order to determine who is financially liable for the dispute. While most disputes will fall under the category of Allocation, some disputes will still require interaction between merchants, acquirers, and issuers (Collaboration). Q: How will pending disputes be managed during the migration period? Any pending disputes that are being dealt with during the migration period, will remain on the previous process. Q: Should I expect the volume of disputes to change? Yes, the volume should lessen. Visa’s new system will evaluate a dispute at the time that it is created by the issuer and will determine the validity of the dispute. Invalid disputes will be returned to the issuer, without any action required by the merchant. Q: Are there any changes to how I challenge a dispute under the new VCR program? The biggest change to challenging a dispute under the VCR program is the deadline that you must respond by to the dispute. If you do not plan on challenging the dispute then you should accept the dispute. For Collaboration disputes, you must respond to the dispute by day 24 if you intend to challenge the dispute. For Allocation disputes, you must respond by day 18 if you intend to challenge the dispute. Q: If I challenge a dispute do I still get provisional credit for the amount of the dispute? For Allocation disputes, there will be no provisional credit that is given to the merchant upon challenging the dispute. However, for Collaboration disputes, the process will remain the same as it is today and a provisional credit will be given whenever a Collaboration dispute is challenged. Q: What will happen to the dispute volume associated with reason code 75? Q: What is the Merchant Purchase Inquiry? 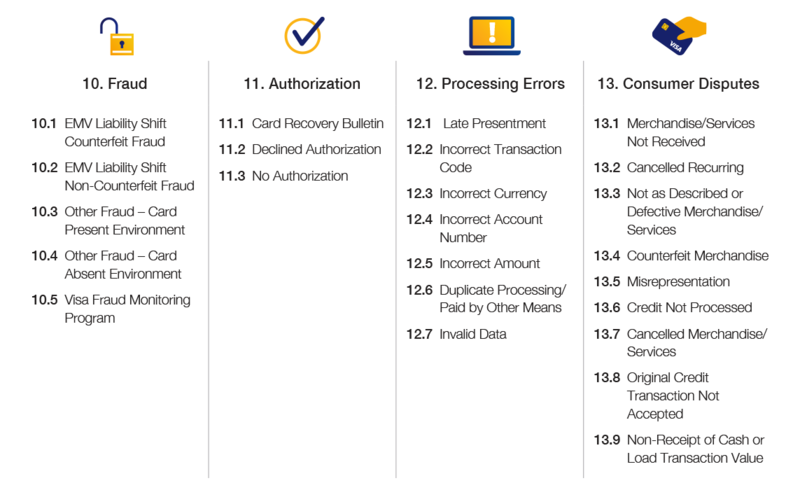 Visa's new Merchant Purchase Inquiry is a plug-in for the Visa Resolve Online (VROL) platform. It allows merchants to either input transaction documentation (purchase information, digital receipt, etc.) or issue a customer credit. The Merchant Purchase Inquiry allows the merchant to bypass the dispute altogether when applicable. More complicated cases may still need manual processing, representment, and arbitration.